UK Gamemaker SCi Entertainment Group outbid Elevation Partners to acquire Eidos Interactive in 2005. Less than two weeks ago, SCi filed papers to officially change their company name to Eidos – aligning the corporate name with their consumer face. If ongoing trade rumors are any indication, however, there may be little need to rush out and print new letterhead. Recent rumors have been circling that SCi/Eidos is on the block and the list of potential suitors includes EA, Ubisoft, Square Enix and Warner Brothers. Other bigger game companies could be interested too. Is there truth in the grapevine? 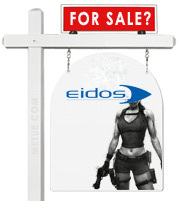 During the mid to late 90’s, Eidos was a high flying prospect with a soaring stock price. The company, which had started as a software shop focused on compression and editing tools, was buying up PC game developers. In 1995, Domark, Simis and Big Red Software became the foundation of the re-focused Eidos Interactive. In ’96, Core Design, the makers of the original Tomb Raider title, joined the mix. The console market, then booming on the strength of Sony’s Playstation and the marketplace’s concurrent acceptance of CD-ROM games over cartridges, became Eidos’ rocket ship. But, between 2000 to ’04, Eidos fell back to earth; their luster lost. In August of 2004, under cash pressures and with mounting losses, the company began discussions to partner or sell out. Elevation Partners, at the time a relatively new private equity firm launched by a mixture of experienced investors and corporate executives, was among the first to come knocking. Elevation offered around $135m (£71) plus added operating capital in an all cash deal. With financial pressure looming, and a 50m operating loss posted during the prior six months, Eidos’ seemed poised to accept. On March 21st, 2005, Reuters even went to the wires with a story that the deal was done. It wasn’t. SCi Entertainment had made a competing bid that shareholders favored. They seemed to believe there was more upside in SCi’s £76.1m stock swap than Elevation’s cash. Elevation withdrew in April and SCi won the prize. Eidos was theirs to fix, if able. Some were skeptical they wouldn’t be. Riccitiello’s crystal ball proved frighteningly accurate. Barely two years later, SCi was back in the headlines as takeover bait. The company confirmed talks were ongoing with potential buyers in September 2007. By January 2008, the talks with unnamed parties broke down. Shortly thereafter, SCi’s CEO and other key executives resigned under heavy shareholder pressure. On and off for the past year since, while SCi/Eidos has tried to turn itself around, acquisition rumors have persisted and kept the company’s name in the press. Today, Eidos employees more than 600 people and is the largest game developer and publisher based in the UK. The company’s Tomb Raider, Hitman and Deus Ex titles remain recognized hits and widely known brands. Despite the name recognition, though, the company is struggling to right the ship. New management has cut staff and weak titles – all part of a restructuring process – but the market cap has sunk from more than £500m to less than £50m in a year. £60m in working capital had to be raised to keep things running smoothly. When SCi’s preliminary annual report was published in September, the company reported an EBIDTA loss for the year ended June 30th of £99.1 on revenue of £118.9m. Even attributing much of that to restructuring, the process of restoring the company is slow going and that’s only compounded by the broader economy and more narrow issues facing the UK game industry. Like John Riccitiello’s forecast for SCi’s prior management, could Livingtone’s comments be a prophetic statement about the future of SCi/Eidos too? Maybe. SCi/Eidos has great brands and solid development credentials. With the weak markets and their present market value, it’s easy to see a potential buyout. Far and away the front runner, WBE and Eidos have been partners since shaking hands in a 2006 joint investment and distribution agreement. The deal made WB Interactive both Eidos’ primary North American distributor and it gave Eidos licensing rights for properties including Batman, Looney Tunes and the Hanna Barbara Catalog. The deal also made WBE a sizable shareholder in the Eidos. As of October 16th, following a 5m share purchase reported the day before, WBI held 16.13% (42.5m) shares of Eidos. Yesterday, a new filing revealed they’d increased their holdings by 10m more shares (purchased on Dec 12) giving them a 19.92% stake in the company. These purchases have come despite the slide of the company and seem to ring out as an endorsement of WBE’s faith in their prospects. Further supporting that view, WBE’s purchases were only possible because the companies renegotiated a “standstill” agreement in October that had otherwise prevented WBE from accumulating a larger position before Jan. 25th, 2009. Also, WBE’s board representative Kevin Tsujihara resigned his Eidos board seat in October. So WBE is buying but has removed itself from involvement in corporate governance decision-making? That has the specter of an “interested party” transaction in the works. There is though, one catch. Reports indicate the “Standstill” Agreement limits WBE from acquiring more than 30% of the company’s stock. A buyout would have to be friendly (which would be expected) and would require further amendment of existing agreements. The possibility is there, but there’s no guarantee. There is an alternate theory too. Just as plausible as acquisition gossip, WBE could simply be accumulating enough of a position to insure it has the power to block out another buyer should one come along. EA is the second of the names often mentioned as an Eidos buyer. Fueling the talks, EA has shown a willingness to pursue acquisitions (Take Two - Deal Diary Here) and CEO John Riccitiello already led one attempt to buyout Eidos in the past (the Elevation Partners offer). •EA has an existing partnership with Eidos for multiregional distribution of mobile games; once dating, a marriage is an easier prospect. •Crystal Dynamics, the Eidos studio behind current generation Tomb Raider games is a stone’s throw from EA’s campus in Silicon Valley. EA knows the studio well and would likely be able to integrate it efficiently. The question is, with layoffs and losses still hampering EA too, are they interested in the costs of another merger integration? At a 40% premium to Eidos recent market cap (EA offered Take Two 58% in a stronger market and with a hot title nearing delivery) would equal a price of about £65.5m. That’s about $102m. Even if EA offered far more, and disregards the fact that merger speculation has pushed the price up a little, it wouldn’t break the bank. EA had nearly $1.3b in cash as of September 30th. If EA is interested, they definitely can afford it. Door number there in the merger talk is French publisher Ubisoft. The company is coming off a strong first half with growth in both operating margins and sales, and they’ve been spending to grow. Already in the past year, Ubisoft has opened two new studios (Kiev and Sao Paulo) and acquired a 3rd in India. They also opened their checkbook to buy Massive Entertainment and special effects experts Hybride Technologies. All that buying and focused growth makes the prospect of another deal seem entirely possible. What also makes Ubisoft an interesting buyer is their focus on movie and gaming convergence. From Tom Clancy titles to Prince of Persia, and demonstrated in the buy of Hybride, the Hollywood connection appears to be a key part of the company’s strategy. Eidos, with its crossover Tomb Raider and Hitman franchises would be complimentary. The question with Ubisoft is, can they afford it? If it’s a cash deal in the range of £60m to £80m (€66 to €88) the answer is no. Ubisoft’s net cash position as of Sept 30th was €72.3m (PDF). A Ubisoft buyout of Eidos would have to be either a stock-based deal, debt driven, or be structured as some form of hybrid. It’s either that, or a complex three way deal that gives Ubisoft the development tasks but keeps an equity partner like WBI in the middle. If the other three companies are the leading candidates in the order listed, Japanese publisher Square Enix is the unlikely wild card. They’ve been linked to Eidos by UK outlet MCV. Best known in the west for their Final Fantasy Franchise, the story goes that Square Enix is interested in buying up a bigger swathe of ground in western markets – either through an established hit franchise or a high end studio. Hitman and Tomb raider along with Eidos’ IO Interactive or Crystal Dynamics groups could fit that bill. As stories go, it makes sense but given WBE’s relationship as Eidos’ distributor in North America, it doesn’t seem likely. Nor does the prospect of Eidos selling off just one brand or studio property. There’s not been any rumor or report factually linking Take Two to Eidos but as a wild card, it’s worth a bit of consideration. There’s a question of whether Take Two is big enough to stay solo without buying. If something were to arise linking Take Two and Eidos’ there’d also be a bit of poetic symmetry to it. In 1993, current Take Two chairmen Strauss Zelnick, then president of 20th Century Fox’s film studio, was hired to run Crystal Dynamics. At the time, Crystal Dynamics was a young startup aiming to become a publishing powerhouse. Zelnick lasted a year before being replaced by Randy Komisar, a former star at Lucas Arts. A year after that, Komisar was out too. The company rebuilt itself as a boutique and sold out to Eidos In 1998. If Zelnick’s Take Two were to buy Eidos’ it would bring him full circle. Financially, if Take Two is interested, they have the cash: $338m as of July 31st. (Next Take Two earnings are tomorrow). Another bit, Rockstar Games, one of Take Two’s top divisions (they make the Grand Theft Auto franchise) has significant development studios in the UK. Rockstar North and Rockstar Leeds. An acquisition of a big UK developer like Eidos would have some overlap. There’s a lot of talk about Eidos and somebody may well buy them up within the next six months. Now – for a sidebar of small world stories, and six degrees of separation – Eidos’ studio, Crystal Dynamics, had funding from Kleiner Perkins when still an independent startup. Former EA standout Bing Gordon, chief creative officer at EA from 98 to 2008 is a Kleiner partner. Strauss Zelnick, Take Two’s Chairman, got his start in the gaming industry running Crystal Dynamics. Randy Komisar, Zelnick’s replacement at Crystal Dynamics is a Kleiner Partner too.